Our thanks to MaMa Jean’s Natural Market for sponsoring OACAC this month during their MaMa’s Spare Change for Change campaign. When you shop for your favorite products at any of the MaMa Jean’s locations around Springfield, you can donate your change into the canister located at the register. Your donations support the OACAC programs and projects working to alleviate the causes and conditions of poverty in the Ozarks. MaMa Jean’s matches donations up to $250. Information about MaMa Jean’s products and locations can be found at https://www.mamajeansmarket.com/. 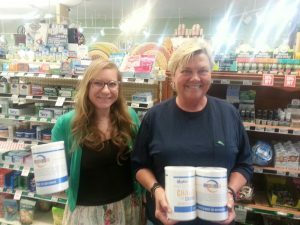 Pictured below: Amber and Diana of MaMa Jean’s, holding the change canisters in the S. Campbell store.